Last February was the second meeting of the Filmmaking Bootcamp, and I’m proud to say we had another great session. The morning started with guest speaker Rob Muir. Rob is a screenwriter (YOURS MINE AND OURS, DUCK DUCK GOOSE) and a filmmaker who showed his short film, HIDING IN WALLS , which details his experiences as a screenwriter and stars Danny Trejo and Jane Lynch. Rob then talked a bit about the process of making short films. The group then broke into teams with all the Directors and Assistant Directors meeting with COC/USC grad Heather Duncan. Joining Heather was Branden Morris of Alpha & Omega Productions and actor and COC grad, Marcus Langston. The three explained the pressures and responsibilities of directing as well as the need for organization and tactics for success. Producers met with me as well as screenwriters Jim McClain and Rob Muir where they were taught how to break a screenplay down as well as how to plan a film shoot. At the same time, several of COC’s best tech students were introducing your students to our professional level equipment. Working with the high school students were COC students Jamie Akira, Carder Keyes and Daniel Greenberg. Joining them from A&O Productions was COC grad, Daniel Leary. This was a hands-on workshop, and each of the students had time to explore the amazing COC equipment. With two hours to go, the students then broke into their production teams and continued work on their final projects with the help of their mentors. New to the mentoring process this session were Rob Muir and Marcus Langston who joined forces to help one of the teams working on a coming of age comedy. Mentoring other groups were me, Heather Duncan, Jim McClain and Adam Weideman (current COC film student). After a creative session, each production group (5 in total) stepped up to do the Shoot and Scoot Challenge. This project had each of the groups armed with a camera, a COC mentor and a simple prompt like “a gift” or “something lost.” The rest was creativity on the fly as they had to make a short film using in-camera editing. This means they could not edit the film after the fact and had to keep or toss a shot before moving on. The morning ended with a screening of the Shoot and Scoot Challenge. The films were met with laughter and praise with some of the films reaching far beyond the level of high school filmmaking and all looking far better than an idea hatched and shot in an hour. While it was intended for our production to take place on March 10th, I realized the projects would not be developed sufficiently so we’ve pushed out production date off by several weeks. The Bootcamp will reconvene on March 10th for another development session and set our sights on April 14th for our film production date. My commentary on this group is that they are amazing. Nearly all our students from day 1 returned and a few who missed day 1 showed up asking to be put back in the program (we did). In total we had more than 30 students attend. The mentors all commented on their limitless energy and desire to learn. I assure you each and every student represented their high schools with pride and honor. As a district, you should be proud. There is no doubt that Santa Clarita has talent. The day opened with a screening of a short film called THUNDER ROAD, then went into a lecture about the foundations of a quality short film. The students then screened THE LUNCH DATE and used it as an example of the perfect short film. After covering the 11 elements of a short film, Mr. Mita segued the students into learning about short film clichés. At the end of the cliché lecture, the students were formed into 9 teams of mixed students from all schools and sent them on campus to film some of the clichés on cell phones. While this was a fun bonding project, it gave them a chance to work with new friends and understand that the clichés they were recreating and filming, have no place in a quality film. After 45 minutes, teams reconvened and the conversation changed toward screenwriting, in particular, story structure, plot points, page count, and story creation. 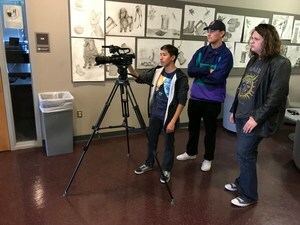 At the 3-hour mark, students formed five production teams and were assigned a mentor and began work on creating an original idea for a short subject movie. Mentors included Ron Mita, Jim McClain (Screenwriter), Heather Duncan (COC/USC Grad and Producer), Adam Weideman (Canyon Grad, COC Student) and Gage Masterson (Hart Grad/COC Student). 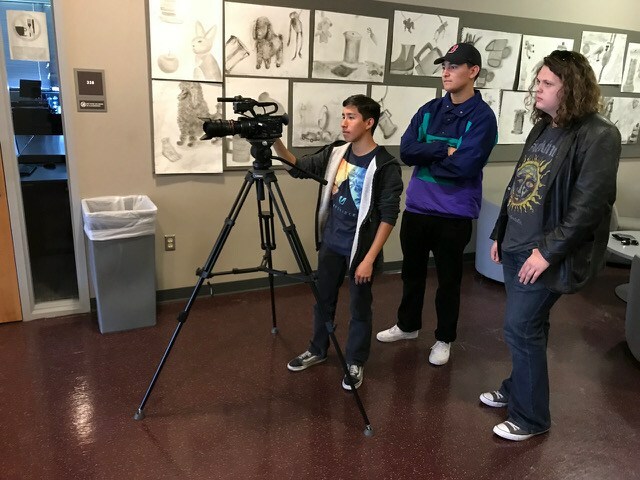 For more information on the next Filmmaker’s Bootcamp, please contact Sue Reynolds Buckley at sreynolds@hartdistrict.org.